The recent death of a Syrian rebel commander at the hands of an al-Qaeda linked group focused the international spotlight on tensions between moderate and jihadi forces fighting in Syria. Rather than signaling a dramatic shift in the nature of the conflict, this high-profile event instead indicates the maturation of an ongoing trend: the ascendancy of hardline al-Qaeda ideologues in Syria. On Thursday, July 11, 2013, Free Syrian Army (FSA) commander Kamal Hamami (aka Abu Bassir al-Ladkani) was killed by members of the Islamic State of Iraq and al-Sham ISI(S) in Latakia. International media has turned their spotlight on this incident, with wide speculation as to what it could mean for the rebels. In fact, tensions between moderate Syrian FSA factions and jihadist extremists affiliated with al- Qaeda have been present since jihadist elements first appeared in Syria, but have become increasingly visible in recent months. While the assassination of Hamami was the most spectacular and high-profile event to date, it is not yet clear that this event marks any significant shift in the tactical relationship between rebel units and al Qaeda groups. Nevertheless, it demonstrates that Syrian rebels are facing a long term threat from al-Qaeda affiliates that want a different future for Syria. Jabhat al-Nusra (JN) has been the most prominent Salafist jihadist organization in the Syrian conflict since it announced its creation in January 2012. It is believed that JN was formed by Syrian jihadists who returned to the country after fighting in Iraq and Afghanistan in the 2000s. Among them was JN's leader, who goes by the nom de guerre of Abu Mohammad al-Julani. The Islamic State of Iraq (ISI), the organizational name for al Qaeda in Iraq, provided support to JN's initial constitution, contributing arms, fighters, and training. Although JN's Salafist goal of establishing an Islamic state under Sharia law does not accord with the idea of a democratic Syria that many moderate opposition fighters hopes to see, JN has proven to be an effective fighting force against the Assad regime, and FSA groups have cooperated tactically with JN on many occasions. Jabhat al-Nusra has employed a cautious strategy in Syria, making efforts to avoid alienating the Syrian population and the FSA. This strategy has included avoiding civilian targets and taking care to minimize civilian casualties when methods like suicide bombings are employed, downplaying sectarian rhetoric, and selecting a name without controversial or partisan connotations. By all accounts this strategy has been successful, allowing JN to continue to gain supporters and prestige in a conflict where its ultimate goal is fundamentally anathema to the underpinnings of the larger revolution. In December 2012, JN was designated a Foreign Terrorist Organization by the United States, and in April 2013 it formally acknowledged its affiliation with al-Qaeda.These developments have both complicated U.S. and European calculations to provide support to the rebels and exacerbated the tensions that marked the relationships between the moderate opposition and the jihadi groups. 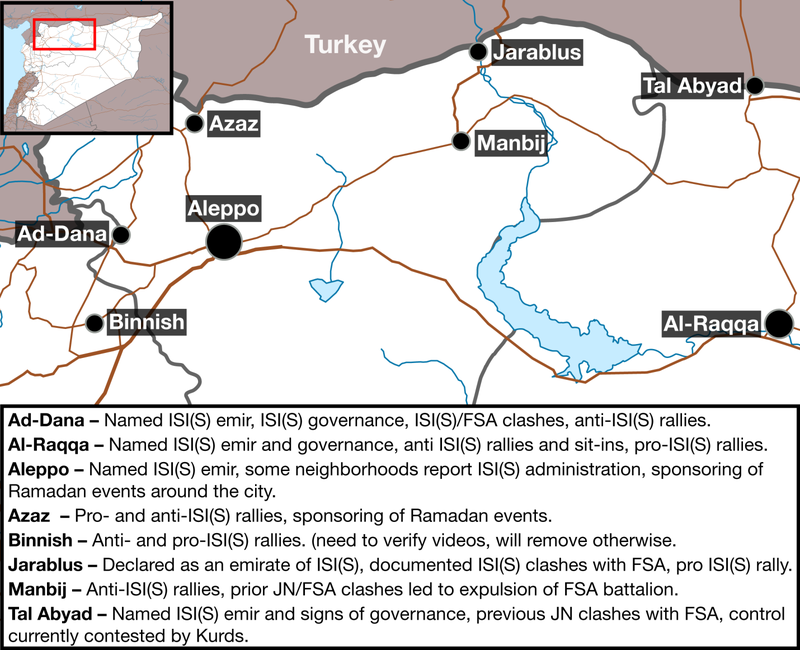 As JN gained strength in Syria, fissures began to appear in its relationship with its "parent" organization, ISI. The tension was made public in April of 2013 when Baghdadi released a statement that JN and ISI were officially merging under the name "Islamic State of Iraq and al-Sham," (ISI(S))a claim which was quickly rebuffed by Julani, who said he had never been informed of any merger. Julani overtly acknowledged JN's allegiance to al-Qaeda in the same statement.Julani indicated that the reason JN held off so long on proclaiming their al-Qaeda affiliation was due to its efforts to understand a Sharia policy that is "appropriate for al-Sham reality," thereby indicating that JN had no intention of merging with ISI to form a pan-Syrian/Iraqi caliphate. JN also implicitly rebuffed Baghdadi for ISI's hardline methods in Iraq in what was likely an attempt to retain JN's standing among the wider Syrian opposition. After this exchange of public claims between ISI and JN, Jabhat al-Nusra appeared infrequently in reports of rebel clashes, and JN's official media outlet al-Manara al-Bayda went quiet. May 2013, however, witnessed a proliferation of videos claiming to be from ISI(S). During this time there was speculation that Baghdadi had come out on top and that JN was collapsing. Then, in early June, a letter from al-Qaeda's leader Ayman al-Zawahiri was published by Al Jazeera. While Zawahiri's letter reprimanded both parties for their role in the dispute, he effectively supported Julani's positions: Baghdadi's original claim of unification was a rogue move, "The Islamic State in Iraq and the Levant" was dissolved, and ISI and JN were instructed to continue operations as independent entities under the al-Qaeda umbrella, each confined to their own geographic arenas. Several interesting developments occurred in the wake of Zawahiri's ruling. On June 14th, al-Manara al-Bayda sprang back to life and began once again releasing information on Jabhat al-Nusra's operations. The brief hiatus in May demonstrates JN's allegiance to Zawahiri since it shows respect for him during his period of deliberation in April and May. Around the same time, Baghdadi issued a bold rejection of Zawahiri's ruling, stating that the Islamic State of Iraq and al-Sham would continue to exist. Accordingly, ISI(S) is now a fact on the ground. As it has continued to operate alongside JN, a confusing picture of how ISI(S) and JN inter-operate in different parts of Syria has emerged. There are places where their names are used interchangeably or both operate but do so separately; where they are distinct but cooperate on attacks; and where one or the other is the sole or prominent actor. Analyst Aymenn al-Tamami, – who analyzes ISI(S)/JN dynamics throughout Syria – notes Aleppo and Deir ez-Zor as cities where JN and ISI(S) function separately, Deraa as a city where JN maintains primacy, and al-Raqqa as a city where they are indistinguishable, although these dynamics are in constant flux. Additionally there are reports of shifting group loyalties and of defections from the ranks of JN to ISI(S), opening up the possibility that individual fighters may hold multiple allegiances. Further adding to the confusion, there is evidence of attacks being misattributed to one or the other group. While some of these misattributions stem from a misleading conception that JN's members are Syrian while ISI(S)'s are foreign and a genuine lack of clarity on the ground, others are likely due to the intentional spread of misinformation by various interested parties, including the groups in question. This type of misinformation and propaganda is pervasive in Syria and will continue to obfuscate opposition dynamics as jihadi groups, moderate opposition elements, and the regime all vie to shape the narrative in the ongoing messaging battle. One key distinction between ISI(S) and JN is that JN has clearly made attempts to cultivate popularity and goodwill among Syrian civilians and fighters. Just this month they launched a new media outlet, Himam News Agency, which posts videos just about JN's civic and social works. With the ISI(S) videos that started appearing after Baghdadi declared ISI(S) into existence in April, it is clear that this group does not intend to follow JN's lead where "hearts and minds" are concerned. They have been vocal about their desire for a pan-Arabic Islamic caliphate, uncompromising in their control, and brutal in their reprisals against those who get in their way, be they regime or rebel parties. JN initially achieved respect even among more moderate opposition forces for its contributions on the battlefield against the regime, but it appears that more of ISI(S)'s energies have been devoted towards imposing governance rather than toppling Assad. The brutal methods of ISI(S) have led to previously-unseen civilian backlash in some areas, mainly in the form of anti-ISI(S) protests. While JN has until now maintained a largely positive reputation among Syrians and moderate fighters, their ideological link to al-Qaeda and close cooperation with ISI(S) have taken a toll on their image. The perception of division in the jihadi ranks has been bemoaned on jihadi forums, and influential figures have called for believers not to take sides. Other jihadi groups in Syria, most notably Ahrar al-Sham, have been able to exploit this division and emerge as potentially stronger jihadi players. Ahrar al-Sham – the strongest component of the Syrian Islamic Front (SIF) – has fought since the early days of the conflict and built a stellar reputation both on the battlefield and in humanitarian activities. Since the ISI(S)/JN dispute began in April 2013, Ahrar al-Sham has reorganized the SIF and uncloaked its previously anonymous leader, Hassan Aboud Abu Abdullah al-Hamawi, in what appears to be a strategic maneuver to gain prestige and support in the wake of the internecine dispute between ISI(S) and JN. A recent international trip and media blitz by Hassan al-Hamawi has indeed boosted the group's prominence and made clear that it has independent support from outside actors in the region. Kamal Hamami's death at the hands of ISI(S)'s local commander in Latakia spurred a media and propaganda frenzy because it was the highest-profile clash between Islamic extremists and the moderate opposition to date. Kamal Hamami was a member of the Supreme Military Council Command (SMC), an organization founded in December 2012 by the Syrian opposition in an attempt to unify its military forces. The SMC consists of 30 elected members – six from each of five military fronts – and is led by General Salam Idris. As the opposition's highest military authority it is their blueprint for a post-Assad national military. Kamal Hamami was one of the six elected members of the SMC's West and Central Front, where he also oversaw the Finance Committee. While the killing of Hamami may have pushed the "jihad in Syria" and "rebel infighting" rhetoric into overdrive, thus far it does not seem to have led to any substantial changes on the ground. Despite reports that the SMC was using the incident to manipulate the U.S. into sending them arms to fight al-Qaeda, rumors that JN was distancing itself from ISI(S), and claims that ISI(S) was planning to assassinate other SMC leaders, initial indications suggest that these groups have continued to cooperate in operations against the regime. In fact less than a week after the murder, the matter was relegated to investigation by a Sharia court, and since then it has dropped from the headlines entirely. Considering the operational momentum the regime currently enjoys in Homs, it would be difficult for the weapons-strapped FSA to devote resources to countering this growing extremist presence. Rather than indicating a dramatic shift in the nature of the conflict, Hamami's death signals the maturation of a dangerous trend: the ascendancy of hardline al-Qaeda ideologues iin Syria. One of the most troubling rumors to surface in the wake of Hamami's killing is that ISI(S) plans to declare an Islamic state in northern Syria. The international press has reported that an anonymous "high ranking Free Syrian Army official" told as-Sharq al-Awsat that Hamami's assassination, along with the beheading of a different FSA leader in Ad-Dana a week earlier, signaled the start of this plan, which would culminate with the announcement of an Islamic State in Northern Syrian on the first day of Eid al-Fitr. While this statement is unverified, the reality on the ground depicts an increasing proportion of rebel-held territory in Syria coming under the governance of either ISI(S) or JN. These cities and towns in north-eastern Syria are shown in the map below. A population center has been marked on the map above as being under ISI(S) "control" only if there is sufficient credible evidence to support the prevalence of ISI(S)-related activities in that area. ISI(S) control of a town is demonstrated by the rule of law (through sharia courts), the provision of public services, public outreach initiatives, as well as military supremacy. Photographic and video evidence of rallies for or against ISI(S) (mainly against) provide good indications of their control of an area. Similarly, ISI(S)-sponsored Ramadan events with large numbers of attendees are likely legitimate. While these on their own do not demonstrate control, they are meaningful when combined with other indicators. In the case of Jarablus, a first-hand account from a reputable outlet of Syrian opposition journalists was used. The locations in which ISI(S) is exerting control share other commonalities besides proximity. A number of them, such as al-Raqqa, were previously liberated by Jabhat al-Nusra, often in concert with FSA units. Some of these towns have been free of regime control since early in the war and have struggled to provide rule of law and services. Despite the public dispute between JN and ISI(S) surrounding ISI(S)'s creation, in practice the groups have continued to work together, and ISI(S) seems to have stepped in to exert influence in a number of areas where JN was known to operate. Since there have been no known JN/ISI(S) clashes over these areas it appears that this transition has been fluid and at least tacitly approved by JN. There could be several reasons for this. For one thing, JN was negatively impacted by the public dispute with ISI(S) and does not stand to benefit by continuing to quarrel. Additionally, it has been noted that JN previously took measures to maintain a positive reputation among Syrians, which has come largely from their success on the battlefield, not their sharia courts. Imposing a strict interpretation of sharia law on Syrian citizens – who have lived in a secular state for decades – will tarnish JN's reputation among the moderate opposition. It may be in their short term interest in some cases to let ISI(S) do the "dirty work," and bear the brunt of the backlash. In a July 19 interview with Al-Arabiya, SMC leader Brig. Gen. Salim Idris accused members of ISI(S) of being "criminals" and said that he wants the foreign fighters out of Syria. Because the map above does not include towns where there was not sufficient evidence online to demonstrate ISI(S) control, it is likely that this map actually underestimates the presence of ISI(S). For example, Aymenn Jawad Al-Tamami notes signs of ISI(S) control in Al Bab, which is located in Aleppo province between Aleppo and Manbij. While there is no evidence of ISI(S) control yet in the strategically important city of Saraqeb in Idlib, it exhibits signs of vulnerability. Saraqeb has been under opposition control for over a year, has seen Jabhat al-Nusra attempt to assert control, and there has been some backlash against a public whipping for sharia law violations by Islamists. There have also been allegations of ISI(S) in another strategic city, Tabqah, although these too have not yet been substantiated. The protracted conflict in Syria has made it an attractive battlefront for al-Qaeda; not only because of Syria's strategic location in the heart of the Arab world, but also because it has created the type of environment in which al-Qaeda operates most effectively. War has disrupted the very fabric of Syrian society in hard hit areas, with the breakdown of existing governance structures, the displacement of vulnerable populations, and the increasing difficulty that many people face in meeting their basic needs. The continued expansion of ISI(S) and its hardline governance in northern Syria is worrisome for the moderate opposition. ISI(S) has been effective at setting up functional governance structures in liberated areas, notably in towns that were once controlled by the moderate opposition. Their oppressive and often brutal imposition of control on population centers points to an agenda focused not on freeing the people from the regime, but on carving out and consolidating a base of power. This relatively new development in Syria's war jeopardizes the moderate opposition's hopes for a democratic Syria. For indicators of prior FSA/jihadi tension see Elizabeth O'Bagy, "Jihad in Syria," Institute for the Study of War, September 2012, pp 27-28. Noman Benotman and Roisin Blake, "Jabhat al-Nusra: A Strategic Briefing", Quilliam Foundation, January 8, 2013. For examples of prior FSA/JN cooperation see Elizabeth O'Bagy, "The Free Syrian Army," Institute for the Study of War, March 2013. See Benotman and Blake, "Jabhat al-Nusra: A Strategic Briefing." For an example of JN cancelling an operation to avoid civilian casualties, see pages 53 and 54 of Aaron Zelin's translation of a JN video "al-Manārah al-Bayḍā' Foundation for Media Production presents a new video message from Jabhat al-Nuṣrah: "Fulfillment of the Vow #1,″" posted on September, 10, 2012. http://jihadology.net. "What's in the names of terrorist groups (1): Jabhah al-Nusrah li-Ahl al-Shâm min Mujâhidî al-Shâm fi Sahât al Jihâd," Mr. Orange's War Tracker, May 14, 2013. http://theorangetracker.blogspot.com/. State Department Press Statement, "Terrorist Designations of the al-Nusrah Front as an Alias for al-Qa'ida in Iraq," Victoria Nuland, Department Spokesperson, December 11, 2012. http://www.state.gov/r/pa/prs/ps/2012/12/201759.htm. Translation of "al-Manārah al-Bayḍā' Foundation for Media Production presents a new audio message from Jabhat al-Nuṣrah's Abū Muḥammad al-Jawlānī (al-Golani): "About the Fields of al-Shām"" from jihadology.net, April 19, 2013. "ISI Confirms That Jabhat Al-Nusra Is Its Extension In Syria, Declares 'Islamic State Of Iraq And Al-Sham' As New Name Of Merged Group," summary of Baghdadi's audio message from MEMRI's Jihad and Terrorism Threat Monitor (JTTM), April 8, 2013. http://www.memri.org/report/en/0/0/0/0/0/0/7119.htm. Translation of "al-Manārah al-Bayḍā' Foundation for Media Production presents a new audio message from Jabhat al-Nuṣrah's Abū Muḥammad al-Jawlānī (al-Golani): "About the Fields of al-Shām"" from jihadology.net. In his post "Jabhat al-Nusra's Relations With Other Rebels After the Bay'ah to Zawahiri," Aymenn Jawad Al-Tamimi identifies a number of examples in which rebel battalions (including Salafi groups) reacted to the confirmation of JN's al-Qaeda affiliation by releasing statements that denounced JN's allegiance and the goals of al-Qaeda, but also expressed appreciation for JN's sacrifices and efforts in the fight against the Syrian regime. UAE-based journalist Hassan Hassan identifies additional examples along this vein in his post "Pouring in: Responses from Syrian Islamist Rebels about Al Qaeda Merger." Pieter Van Ostaeyen, "Jabhat an-Nusra and the Islamic State in Iraq and as-Sham ~ A Schism in Syrian Jihad?," May 29, 2013. https://pietervanostaeyen.wordpress.com/. Pieter Van Ostaeyen posted a series of ISIS propaganda videos in his blog on May 22, 2013. https://pietervanostaeyen.wordpress.com/. More May ISI(S) videos are gathered in a guest post by Aymenn Jawad Al-Tamimi on the Brown Moses Blog, " Jabhat al-Nusra and The Islamic State of Iraq and ash-Sham," May 17, 2013. http://brown-moses.blogspot.com/. Mariam Karouny "Insight: Syria's Nusra Front eclipsed by Iraq-based al Qaeda," Reuters, May 17, 2013. http://www.reuters.com/. Basma Atassi, "Qaeda chief annuls Syrian-Iraqi jihad merger," Al Jazeera, June, 9, 2013. http://www.aljazeera.com/. Pieter Van Ostaeyen, "al-Manara al-Bayda ~ The Resurrection (June 14 2013)," June 15, 2013. https://pietervanostaeyen.wordpress.com/. "On al Baghdadi's disobedience of Dr Zawahiri," Shami Witness, June 15, 2013. http://shamiwitness.blogspot.com/. See Aymenn Jawad Al-Tamami's jihadology.net column, "Musings of an Iraqi Brasenostril on Jihad" for his ongoing analysis. Aymenn Jawad al-Tamimi, "Where Does Jabhat al-Nusra End, and the Islamic State of Iraq & ash-Sham Begin?" Syria Comment, July 13, 2013. http://www.joshualandis.com/. Basma Atassi "Qaeda chief annuls Syrian-Iraqi jihad merger," Al Jazeera, June 9, 2013. http://www.aljazeera.com/. Note: some of the news of defections likely comes from a swelling in the ISI(S) ranks due to them taking in unaligned jihadists, since they do not hold the same strict recruitment policies as JN. For more information on these policies see: Noman Benotman and Roisin Blake, "Jabhat al-Nusra: A Strategic Briefing/." For an example of misattribution between ISI(S) and JN see footnote [i] of Aymenn Jawad Al-Tamimi's article "Jabhat al-Nusra and the Islamic State of Iraq and ash-Sham: Deir ez-Zor and the wider east of Syria," June 27, 2013, http://www.aymennjawad.org/. Provision of services, rule of law, and compromising with locals: "Al Qaeda, the new bloods," Levant & Beyond blog, May 26, 2013. http://levantnbeyond.blogspot.com. Provision of food and healthcare: Ghaith Abdul-Ahad, "Syria's al-Nusra Front – ruthless, organised and taking control," The Guardian, July 10, 2013. http://www.guardian.co.uk/. "Reaching out to civilians: Rania Abouzeid, "In Syria, the Jihadist Campaign for Hearts and Minds," Time, April 10, 2013, http://world.time.com/. Attempts to avoid civilian casualties: Tracey Shelton, "Syria: One on one with the leader of Jabhat al-Nusra," Global Post, March 4, 2013. http://www.globalpost.com/. See the Jihadology for Himam News Agency videos. http://jihadology.net/category/himam-news-agency/. See: Zeina Karam, "Rebel Infighting In Syria Undermining Revolt," The Associated Press, July 15, 2013. http://bigstory.ap.org/. Also see: Loveday Morris, "Syrian rebels fear 'side war' as infighting spirals," Washington Post, July 13, 2013. http://articles.washingtonpost.com/. Rita Katz and Adam Raisman, "Special Report on the Power Struggle Between al-Qaeda Branches and Leadership: Al-Qaeda in Iraq vs. Al-Nusra Front and Zawahiri," SITE Monitoring Service, July 1, 2013, http://news.siteintelgroup.com/. "Competition among Islamists," The Economist, July 20, 2013. http://www.economist.com/. "Statement on the Formation of the Supreme Military Council Command of Syria," Carnegie MEC, 15 Dec 2012. "FSA demands more weapons from West," Al Jazeera, July 14, 2013. http://www.aljazeera.com/. Mitchell Prothero, "Syria's Nusra Front tries to show it's a different kind of al Qaida," McClatchy, July 17, 2013. http://www.mcclatchydc.com/. "Key Free Syria Army rebel 'killed by Islamist group'," July 12, 2013. BBC News Middle East. http://www.bbc.co.uk/. "Rebels want Al-Qaeda suspect to face trial," The Daily Star, July 16, 2013. http://www.dailystar.com.lb/. "Al-Qaeda planning to declare Islamic state in Syria, FSA official says," NOW, July 16, 2013. https://now.mmedia.me/lb/en/. Zeina Khodr, "Meeting al-Qaeda in Syria," Al Jazeera blog, July 9, 2013. http://blogs.aljazeera.com/blog/. Zeina Khodr"Presence of al-Qaeda raises tension in northern Syria," Al Jazeera English video, 3:23, July 8, 2013. http://www.youtube.com/watch?v=ukoP7hossqI. Erika Solomon "Rebels clash with Qaeda-linked opposition group in Syria," Reuters, July 6, 2013. http://www.reuters.com/. Anti-ISI(S) protest in ad-Dana, Youtube video, 2:56, posted by Syrian Observatory. http://www.youtube.com/watch?v=mCm3BqKDVdY&feature=youtu.be. Anti-ISI(S) protest in ad-Dana, Youtube video, 1:15, posted by AlgahdTV, http://www.youtube.com/watch?v=5TiM-lNTURw. "Al-Qaeda sets up 'complaints department' in Syrian city of Raqqa," Al Arabiya, June 3, 2013. http://english.alarabiya.net/en/. Anti-ISI(S) rally in Al Raqqa, Youtube video, 1:44, July 14, 2013. https://www.youtube.com/watch?v=UNvgEolfDBA. Sit-in against ISI(S) to release prisoners, Youtube video, 3:30, posted by Ghaith Aal Fakhri, June 20, 2013, http://www.youtube.com/watch?v=Ox5jCIja9Mw; Sit-in against ISI(S) to release prisoners, Youtube video, 2:55, posted by Ghaith Aal Fakhri, June 18, 2013, http://www.youtube.com/watch?v=Pd5zerKjKIU. Pro-ISI(S) rally, Youtube video, 0:54, posted by الإخبارية الرقة وكالة, June 22, 2013, http://www.youtube.com/watch?v=AFC4UBeP2HM. Anti ISI(S) rally in Azaz, Youtube video, 0:23, posted by Shahba2013, July 1, 2013. http://www.youtube.com/watch?v=rBq7t6yiDO0. Pro-ISI(S) rally in Azaz, Youtube video, 1:56, posted by الإعلامي اعزاز مركز, July 5, 2013. http://www.youtube.com/watch?v=0weoF1iCoIM. A notice for ISI(S)-sponsored Ramadan competitions in Azaz was posted by twitter user @reyadiraq on July, 20, 2013. https://twitter.com/reyadiraq/status/355094509081751552. While it is not possible to verify a piece of paper, there are several videos of events matching this description posted on youtube from different locations in Aleppo. Anti-ISI(S) rally in Binnish, Youtube video, 0;35, posted by theinsidersy, July 19, 2013. http://www.youtube.com/watch?v=0uOkx3rsVuQ. Pro-ISI(S) rally in Binnish, Youtube video, 0:50, posted by theinsidersy, July 5, 2013. http://www.youtube.com/watch?v=WDQmV_f-J7k. Youssef Shaikho, "Jarablos: From Syrian city to Islamic Emirate," The Damascus Bureau, July 12, 2013. http://www.damascusbureau.org/. Anti-ISI(S) demonstration in Manbij, Youtube video, 1:48, uploaded by Moetaz AboRyad, July 12, 2013. http://www.youtube.com/watch?v=j7hXCYaIU0U#at=69. Aymenn Jawad al-Tamimi "The Islamic State of Iraq and ash-Sham Expands Into Rural Northern Syria," Syria Comment, July 18, 2013. http://www.joshualandis.com/. Erika Solomon, "Islamist-Kurdish fighting spreads in rebel-held Syria," Reuters, July 21, 2013. http://www.reuters.com/. Aymenn Jawad al-Tamimi, "GUEST POST: Jabhat al-Nusra and the Islamic State of Iraq and ash-Sham: Raqqah Governorate," Jihadology, June 4, 2013. http://jihadology.net/. Rania Abouzeid "In Syria, the Rebels Have Begun to Fight Among Themselves," Time, March 26, 2013. http://world.time.com/. Richard Spencer and David Rose, "Under the black flag of al-Qaeda, the Syrian city ruled by gangs of extremists," The Telegraph, May 12, 2013. http://www.telegraph.co.uk/. "The Manbij Experiment: Rebels Make a Go of Governing in Liberated City," Europe Voice, October 3, 2012. http://euvoice.eu/. Zeina Karam, "Rebel Infighting in Syria Undermining Revolt." "Residents demonstrate against Jabhat al-Nusra in Syria," Al-Shorfa, January 25, 2013, http://al-shorfa.com/. ""The Security Battalion In Saraqeb" Starts Patrolling The Streets," Brown Moses Blog, May 21, 2013. http://brown-moses.blogspot.co.uk/.